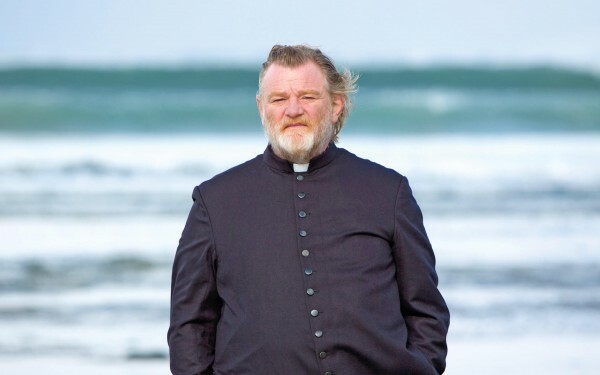 Brendan Gleeson stars as the local priest of a small Sligo village, having entered the priesthood following the death of his wife. One day, while taking confession from a local man, Gleeson hears how this man (whose identity is known to the priest but never revealed to us, the audience) was subjected to sexual abuse at the hands of a priest during his childhood. Gleeson admits that he has no words to console the man, who informs the priest that he is giving him a week before he murders him. Calvary is the second feature from writer-director John Michael McDonagh, brother of Martin McDonagh (In Bruges, Seven Psychopaths). His debut, 2011’s The Guard, featured Gleeson in the lead role of a smartass Guard with a death wish in a small rural Irish town full of idiots. Calvary features Gleeson in the lead role of a smartass priest with a death wish in a small rural Irish town full of narcissists. While Irish audiences ate up the humour of The Guard (if there’s one thing we’re good at, it’s having a laugh at our own expense) I doubt McDonagh’s latest will be received so warmly, as it’s quite the hatchet job. There are basically two types of people in the Ireland of the 21st century: those who blame all their troubles on the banks and the church, and those who are sick of listening to people blaming all their troubles on the banks and the church. McDonagh’s film assumes the stance of the latter. While it’s a refreshing approach, it’s one he’s not qualified to take. He may call himself Irish, due to his heritage, but McDonagh is a Londoner who, on the evidence of Calvary, doesn’t know the first thing about Irish society. Calvary seems to be set in the only village in Ireland where everyone outwardly expresses their feelings about one another. Sure, there’s a lot of contempt towards the church for the various wrongdoings and subsequent cover-ups of the last century but, in reality, Irish people only complain about the church when out of earshot of the local priest. Gleeson’s priest, however, is constantly subjected to a barrage of abuse from practically everyone he encounters. With this many outspoken atheists, Sligo seems closer to Stockholm in McDonagh’s imaginary vision of recession Ireland. The film is partly funded by the Irish Film Board, which seems odd given how negatively it portrays the inhabitants of this isle. The only characters cast in a positive light are an American writer (played by the great character actor M Emmett Walsh), a French widow and Gleeson’s estranged English daughter. Some day a great movie will be made about the small town Irish psyche but it will be made by an Irish film-maker. Sadly, it probably won’t be funded by the Irish Film Board; they seem to favour “Oirish” film-makers over Irish ones. Pictured: Brendan Gleeson in Calvary. Photo courtesy of Entertainment One.